On Thursday, January 18, for the opening Colloquy of the new quarter, former PUC alumna and instructor of psychology Allison Musvosvi spoke to a crowded sanctuary. 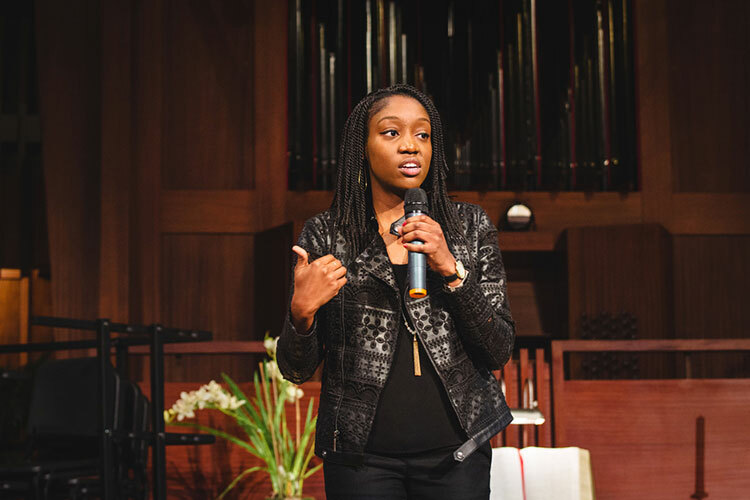 In her talk, titled “#woke?”, she shared narratives from her childhood upbringing in Zimbabwe, Malawi, and Botswana, and her experience immigrating to the United States. She also encouraged the audience members to have hard conversations surrounding race and privilege. Musvosvi currently works as a research analyst at ILLUME Advising, LLC. Musvosvi recounted having her understanding and concept of race broadened after moving to the United States and learning about Latinos, Native Americans, and other ethnic groups, and noticing the color of her skin and her country of origin made people classify her differently. She told the story of her first day of school in America, when her teacher spoke very slowly to her after class and asked whether she had food. Musvosvi realized the teacher assumed she might need help, based on their concept and bias of Africa, her accent, and the fact that she was thin. When discussing what it means to be #woke, Musvosvi said she believes, “It’s the recognition and the expectation that being uncomfortable and feeling uncomfortable is a necessary part of unlearning our oppressive behaviors.” She encouraged the audience to think about the places they feel comfortable and to recognize most likely they are comfortable there because they are occupying a place of privilege in that space, and it may come at the expense of someone else and their comfort. She challenged the audience to have conversations with people different from themselves, particular those in marginalized groups, and to utilize the internet to read and learn about other peoples’ experiences. The Colloquy service was a highlight of a week full of diverse and cultural celebrations, including a presentation entitled “Who Am I?” that explored the complexities and challenges of the Black identity through a panel discussion presented by the Black Student Union; a talk from the Student Organization of Latinos (SOL) Club honoring Hispanic heritage and support for the Deferred Action for Childhood Arrivals (DACA) program; and special food-based events featuring a variety of cultural foods, including rice cakes from the Korean Adventist Student Association (KASA).